The word azotemia is made up of two words, ‘azot’ means nitrogen and ’emia’ means in blood. It is a laboratory abnormality which is characterized by urea nitrogen and creatinine increased above a normal range. It is a type of nephrotoxicity and in severe conditions can adversely affect the kidneys and lead to renal failure in patients. Perturbation in any of the above processes will impair the excretory function, resulting in azotemia. The quantity of glomerular filtrate produced each minute by all nephrons from both kidneys is known as glomerular filtration rate (GFR). The normal GFR value is 125mL/min (women have 10% less than men). On an average, about 99% of the filtrate is reabsorbed and the remaining is excreted in form of urine. Uremia is a condition in which urea appears in urine. Even though urea is a major component that is actively excreted in urine but in such a condition, excess amounts of nitrogenous products including those obtained from amino acids and protein metabolism are excreted. Uremia is a pathological demonstration of severe azotemia. This can cause damage which can be pre renal, renal or post renal. Presently, azotemia has been classified in 3 different types. 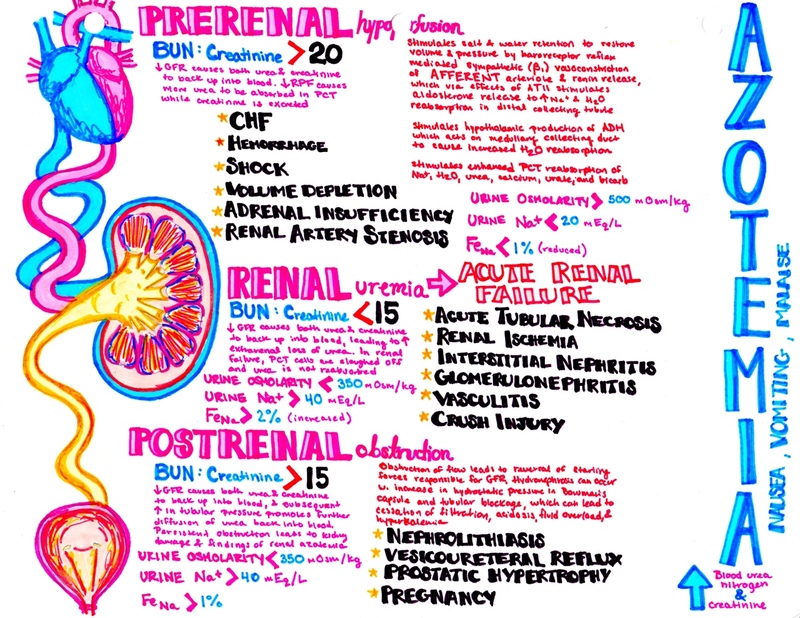 These classes are: prerenal azotemia, intrarenal azotemia and postrenal azotemia. This classification is done on the basis of the site of the renal system which is affected. Prerenal azotemia occurs due to a decrease in glomerular filtration rate (GFR) which occurs due to disturbances in circulatory system ultimately causing decreased renal perfusion. If the renal perfusion decreases, it can worsen the condition of the patient as it can cause hypervolemia, cardiac diseases. As a result of insufficient blood flow excess of nitrogen occurs in the blood. This has been the most common cause of failure of kidneys especially in hospitalized patients. When the volume or pressure of blood is decreased, the baroreceptor reflexes which are present in aortic arch and carotid sinuses are activated. As a result there is activation of sympathetic system resulting in the vasoconstriction of renal afferent arterioles and secretion of rennin through β1 receptors. This constriction of the arterioles leads to decrease in intraglomerular pressure and a proportional decrease in GFR is observed. Reduced blood flow results in production of renin, which converts angiotensin I to angiotensin II. Angiotensin II secretion further stimulates the secretion of aldosterone. Raised levels of aldosterone in kidney result in the absorption of salt and water, more specifically in the regions of distal collecting tubules. Furthermore, when the blood flow to kidneys is decreased or a decrease in pressure is sensed, a non-osmotic stimulus is activated that includes the production of anti-diuretic hormone from the hypothalamus. ADH exerts its effect in the collecting duct in the region of medulla for water reabsorption. However, through unidentified mechanisms, sympathetic system is activated which leads to enhanced tubular reabsorption of salt and water as well as BUN, uric acid, creatinine, bicarbonate and calcium molecules in proximal region. As a result of this, the total salt and water retention is decreased and as an outcome of which decreased urinary excretion of sodium is observed. Conditions that reduce the blood flow to the kidney may cause pre-renal azotemia. Examples include; burns, loss of blood volume, heat exposure, decreased fluid intake, long term vomiting, diarrhea and even chronic bleeding. Pre renal azotemia can even occur in those conditions where the heart is unable to pump enough blood such as heart failure or septic shock. Finally, condition in which there is disruption in the blood flow to the kidneys will also cause pre-renal azotemia. Intrarenal azotemia is also identified as acute renal failure (ARF), renal-renal failure and acute kidney injury (AKI). It is distinguished by the excess accumulation of nitrogen in blood which is basically due to the damaged kidneys and their disturbed functions. There are various definitions, including an increase in serum creatinine levels of 30% from baseline or sudden decrease in output below 500mL/day. AKI is basically non-oliguric; a condition when the output falls below 500mL/day, ARF is oliguric. Any kind of AKI can be so severe that it virtually stops the formation; this condition is called anuria (<100mL/day). Some of the recent studies have shown and indicated that the nonoliguric forms of AKI are correlated with less morbidity and mortality than is oliguric AKI. More studies have also demonstrated that volume expansion, renal vasodilators and some of the potent diuretic agents have the ability to covert oliguric AKI to non oliguric AKI. However, this is only possible when these drugs are administered early. The pathophysiology of both oliguric and non-oliguric acute kidney injury depends on the site of the injury. In acute tubular necrosis (ATN), the functional decrease in the ability of the tubules is due to epithelial damage. As a result, the reabsorption of salt, water and other electrolytes like sodium, bicarbonate is declined. Additionally, the excretion of acid and potassium is also impaired. In severe cases, the tubular lumen is filled with epithelial casts causing intraluminal obstruction and hence resulting in a decline in GFR. Net effect is a loss of urinary concentrating ability, as an outcome of which there is low osmolality, low specific gravity, high urinary sodium and often hypokalemia tubular acidosis is seen. On the other hand, if prerenal azotemia is superimposed, the specific gravity, sodium content and hence osmolality may be misleading. Glomerulonephritits or vasculitis is proposed in the presence of hematuria, red blood cells, white blood cells, granular and cellular casts, and even unpredictable amount of proteinuria. Nephrotic syndromes, however is not allied inflammation and if proteinuria is seen, it is greater than 3.5g/24h. Some patients with nephrotic syndrome may present with acute renal failure. Destruction of capillary construction in the kidneys either due to edema or obstruction of tubules from protein casts, also a decline in effective has been suggested as the mechanisms for the progression of ARF in patients suffering from nephrotic syndrome. Acute vascular diseases which include malignant hypertension, scleroderma renal crisis and several other conditions, all of which might cause renal hypoperfusion and even ischemia lead to azotemia. 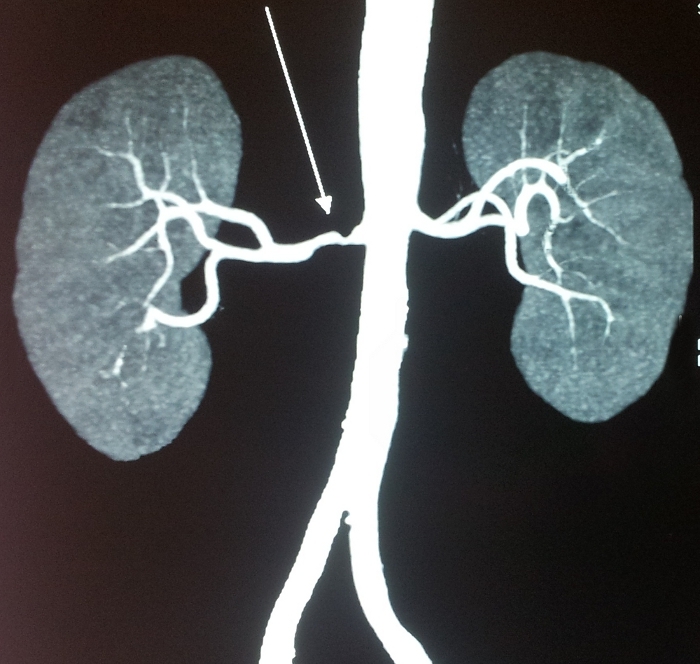 Apart from this bilateral renal artery stenosis might also lead to intra renal azotemia. 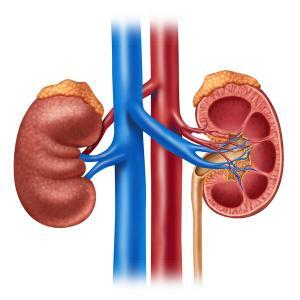 How does bilateral renal artery stenosis lead to azotemia? In bilateral renal artery stenosis, maintenance of sufficient intraglomerular pressure for filtration process depends on efferent arteriolar vasoconstriction. Azotemia occurs when angiotensin converting enzyme (ACE) inhibitors or angiotensin II receptor blockers (ARBs) cause the dilation of efferent arterioles leading to a decline intraglomerular pressure and filtration. It is due to this effect that ARBs and ACE inhibitors contraindicated in bilateral renal artery stenosis. Decrease in acid, potassium and water and salt excretion leading to acidosis, hypertension, and edema. Dysfunctioning of platelets, this may cause to enhanced bleeding tendencies. Several classes of medicines have been majorly involved kidney damage. These include aminoglycoside toxicity, anti-fungal drugs, chemotherapy agents such as lithium toxicity and cisplatin toxicity, biological therapies, ACE inhibitors, radiological contrasts and few NSAIDs. It has been found that some of the medical conditions such as pyelonephritis and diabetes can also cause intra renal azotemia in patients. Post-renal azotemia is a condition when an excess of blood nitrogen occurs due to the blockage in the kidneys as a result of which it prevents the urine to excrete out from the renal urinary system. It also causes painful urination. Hindrance to flow leads to reversal in the Starling forces which is responsible for the glomerular filtration. Progressive bilateral obstruction causes hydronephrosis with a rise in Bowman capsular hydrostatic pressure and blockage in the tubules that leads to gradual decrease in and ultimately is the stoppage of glomerular filtration, acidosis, hypokalemia, fluid overload and azotemia. Blockage maybe due to any of the following reasons: stone, infection, enlarged prostate gland (in elderly male patients) or even a tumor (both malignant and benign). Azotemia is rarely caused by bilateral obstruction. Evidence is present that if complete obstruction is present at the ureteral site, it can be recovered within a time span of 48 hours of the onset, and relatively a complete upturn of the glomerular filtration rate can be achieved within a week. However, after a span of 12 weeks, little or no recovery is possible. Moreover, complete or chronic obstruction of ureter can cause tubular atrophy or irreversible renal fibrosis. If the collecting system is enclosed by retroperitoneal tumor or fibrosis, chances for hydronephrosis may be absent. How does pre-existing kidney disease influence azotemia development? According to reports, the incidence of hospital acquired or even community acquired acute renal failure has shown a variable pattern. In a study carried, it is responsible for approximately 1% of hospital readmissions. In chronic kidney disease, gradually worsening azotemia leads to end stage renal disease thus making it important for the patient to have dialysis or undergo kidney transplantation. Kidney transplant is often recommended in patients who are already going through other chronic medical conditions such as diabetes, hypertension, cystic kidney disease, glomerulonephritis and other commonly occurring kidney diseases. Which populations are at a higher risk of developing azotemia? According to demographic survey, the frequency of occurrence in males was 56% whereas in females it was found nearly 44%. If we looked according to age groups, the highest rate was found in those people aging between 65-75 years and the lowest was among children between 0-19 years. Racial distribution showed that azotemia was more common in white people followed by black and Asians. The prognosis of azotemia due to AKI/ARF is poor and is highly dependent on the original disease and to which extent the organs are damaged in that disease. However, in patients without an underlying disease, the mortality rate is low around 7-23% as compared to those who are admitted in hospital in intensive care unit (ICU) on a ventilator. Mortality rate for such patients have dangerously increased up to 80%. The prognosis of chronic kidney disease greatly depends upon the etiology. Patients going through diabetic kidney disease, ischemic nephropathy (i.e. large vessel arterial occlusive disease) have a tendency for the worsening of the conditions from azotemia to end stage renal disease. It is important to know as early as possible if the azotemia is either acute or chronic and whether it is caused due to prerenal, intra renal or post renal factors. This is essential in determining the treatment and further stopping the progression of disease. Evaluation of azotemia clinically, requires a complete history, physical examination and other laboratory tests. Patients experiencing prerenal azotemia have typical history of diarrhea, vomiting, heat exhaustion, sweat loss, concurrent illness that disturb their tendency to eat and drink according to the need of body, liver disease, hemorrhage, congestive heart failure and even polyuria. Patients going through intra renal azotemia may have the history of polyuria, proteinuria, nocturia, shock and edema. Other reasons include hereditary linkage or systemic diseases like diabetes, hypertension, and systemic lupus erythematosus, various collagen vascular diseases, hepatitis B, hepatitis C, syphilis, AIDs. After a comprehensive history has been taken, it is important to look for nephrotoxic medications like antibiotics, non-steroidal anti-inflammatory drugs (NSAIDs), angiotensin converting enzyme (ACE) inhibitors, diuretics and selective herbal treatments. Chemical exposure given to cancer patients and drug abuse especially those consuming through intravenous routes also cause nephrotoxicity. Patients who have post renal azotemia often have a history of benign prostatic hypertrophy, renal colic, dysuria, frequency, hesitancy, pelvic malignancy. In suspected patients of prerenal azotemia, look out for tachycardia, orthostatic hypotension when the systolic blood pressure drops down to more than 20 mm Hg or diastolic drop more than 10mm Hg, signs of dehydration, including dry mucus membrane, loss of skin turgidity, loss of sweat, and signs of congestive heart failure or hepatic insufficiencies. In patients who have been suspected with intra renal azotemia, look for hypertension and its end organ side effects, like hypertensive retinopathy and left ventricular hypertrophy, rash, joint swelling or joint tenderness, abnormalities in hearing, abdominal bruits, palpable kidneys and pericardial rub. Pericardial rub is a characteristic sign of uremia. However, occurrence of uremic pericarditits requires immediate dialysis. Post renal azotemia in which obstruction is seen, a palpable bladder is observed which is dull to percussion and the presence of mass in pelvic or rectal regions is seen when digital examination is done. For the start of evaluation, the first step is to obtain a complete blood count (CBC), a biochemical profile, urinalysis, and urine electrolyte concentrations. These tests give hints on determining the original cause of azotemia. Diagnostic indices are used to differentiate among prerenal azotemia, intra renal azotemia and post renal azotemia. Even though such indices are useful but because it is not in the compulsion workup plan demand, these tests are not performed on every patient. Prerenal Azotemia: in this, the hemoconcentration outcome is the increased hematocrit value and total protein/ albumin, bicarbonate, uric acid and calcium levels from baseline values. When volume depletion is more dominant, amplified proximal tubular reabsorption usually results in azotemia. Along with azotemia, hypernatremia, and increased levels of calcium, bicarbonate and uric acid leads to rise in the values of hematocrit values, albumin and total protein. It has been observed that these values vary widely. One of other major determinant for differentiating between prerenal azotemia and acute tubular necrosis is fractional excretion of sodium (FENa). A value below 1% proposes a prerenal cause like volume depletion. Above 2% suggests the presence of acute tubular necrosis. As FENa is dependent on the fact that reabsorption is enhanced in the setting of the volume depletion, use of diuretics may raise the value of FENa even volume depletion is present. Intrarenal Azotemia: in this, anemia, hypocalcaemia, thrombocytopenia, and elevated anion gap metabolic acidosis may be present. Patients suffering from chronic CKD, their renal ultrasonography usually show small kidneys. However, in some cases of CKD kidneys may be of normal size or even enlarged. This is usually the case with HIV nephropathy, diabetes and renal amyloidosis. Patients with polycystic kidney disease are recommended to undergo renal sonogram for the confirmation of diagnosis. Postrenal Azotemia: Set of urinary indices in this condition which is due to complete bilateral blockage is not really useful in diagnosing the medical condition. The prime finding in this is the anuria, which may or may not be accompanied by hypertension. If partial ureteral blockage is present, urine flow may be present. Foley’s catheter must be inserted in the initial steps of evaluation. This is done to confirm that there is no obstruction at the bottom of urinary bladder. When obstruction occurs unilaterally, it gradually progresses to azotemia. It occurs acutely like in cases of obstruction from calculi or hematoma causing renal colic. It can also be chronic and does not show any symptoms leading to the formation of hydronephrosis. Bilateral obstruction may be linked with azotemia in the presence of normal urine flow. Patient who are given maneuvers have an increased urine output because of which they show an increased pressure in the collecting ducts and possibilities are that they may even feel pain. Along with azotemia, polyuria, type 1 renal tubular acidosis, with hypercalcaemia, hypokalemia and even a prostatic pelvic tumor and in turn raised prostate specific antigens (PSA) levels hints towards post renal azotemia. Renal ultrasonography is the test of choice for excluding the obstructive uropathy. This is used for determining the size of kidneys and echogenicity which is an important consideration in renal biopsy. It also helps in the differentiation of cystic lesions from solid lesions and in the spotting of kidney stones. Doppler ultrasonography identifies the vascular flow of kidneys which can be useful for renal artery stenosis. Besides ultrasonography, other techniques are used in evaluation of the clinical condition. These include Computed tomography (CT) scan, Magnetic Imagining Resonance (MRI), abdominal radiography, pyelography and angiography. Recently new techniques are derived such as radionuclide involved studies. Renal biopsy is also recommended. Each of these procedures has their own limitations and uses. Their recommendation is highly dependent on the doctor who is checking the patient. Renal Biopsy has certain contraindications such as when the size of kidneys is smaller than normal, severe consistent hypertension, hydronephrosis, multiple cysts or tumors, renal or peri renal infections. It is also not recommended in patients who not showing cooperation. Prerenal Azotemia: if the reason behind the volume depletion is water loss, the levels of serum sodium raises up to 10mEq from normal. The fluid which is to be administered to the patient should be a hypotonic solution for example, 0.5% saline or 5% dextrose solution in distilled water (D5W). The patients are counseled and encouraged to drink more and more water via oral route. If not possible, nasogastric route is utilized. Serum sodium levels are constantly monitored every other 6-8 hours and fluid replacement therapy should be such that serum sodium levels are maintained to avoid reaching the precipitous decline. In cases of volume depletion due to chronic or excessive bleeding, it is required to administer IV saline and transfusion for maintaining the pressure. Fluid loss in diarrhea needs to be replaced by normal saline but when normal anion gap metabolic acidosis occurs; bicarbonate in 0.5% normal saline should be given. When there is decreased effective arterial volume of blood due to the shunting of the system either due to failure of liver or septic shock it results in a number of problems such as reduced oncotic pressure, raised vascular permeability and more salt and water reabsorption. In such cases, effective treatment of sepsis is possible with antibiotics and for hypotension, epinephrine and nor epinephrine is required. If the treatment is proper, it may improve the oncotic pressure and bring the vascular permeability back to normal. The net outcome is better renal perfusion, and preventing the shunting of the system. Intrarenal Azotemia: Acute kidney disease; in case of ischemic or nephrotoxic kidney injuries, which occur due to shock. Shock can be hypovolemic, cardiogenic or even septic shock. The initial plan is to reinstate volume and pressure both. This can be done by fluid replacement therapy and vasopressors. If the patient experiences oliguria or anuria in shock, crystalloids should be immediately administered as bolus. However, if even after the administration of around 2L of liquid in a short time, no recovery is seen a high dose of furosemide at 100-160mg is prescribed to the patient. If the patient is unable to improve even after 6 hours put the patient on dialysis. Albumin can be given along with furosemide to augment the diuretic effect. Albumin is basically to increase the bounding between drug and protein and fasten its delivery through organic anion transporter. The renal failure stage can last for 7- 21days if proper treatment is given immediately. Chronic kidney disease: these patients are advised to undergo dialysis and even kidney transplant is severe cases. According to some studies, it has been seen that patient can recover in short duration after renal replacement therapy. The progression of disease can be slowed down by controlling the concurrent diseases such as diabetes, proteinuria, and hypertension. Other measures include limiting the protein & phosphate intake. Other medical conditions like anemia, acidosis should be treated first and then replacement therapy should be initiated. Postrenal azotemia: opening of the obstruction should be the core of the therapy. When anuria is present, catheter should be inserted in the bladder. When there is obstruction in ureters and it has caused hydronephrosis, either unilateral or bilateral stenting is done. The revival of the renal function is done within 7-10 days but it depends on the severity of the condition. In extreme cases, full recovery is not possible so only a partial recovery is seen. Around 500-1000ml/min of urine flow occurs postoperatively. Yet, a large amount of salt and water is wasted during the process, dehydration may occur. For such patients, normal saline and potassium chloride (to treat hypokalemia) is recommended. Monitoring is necessary otherwise the patient may become hypotensive. The main target should be to maximize the renal blood flow and keep a balance of urine output. The following are drugs that are given in patients with azotemia. Volume Expanders: these help in raising the plasma oncotic pressure and helps in the movement of the fluid from interstitial space to intravascular space. Alpha/ Beta adrenergic agonists: they show their effect mainly by causing dilation of the vasculature and consequently perfusion gets improved.